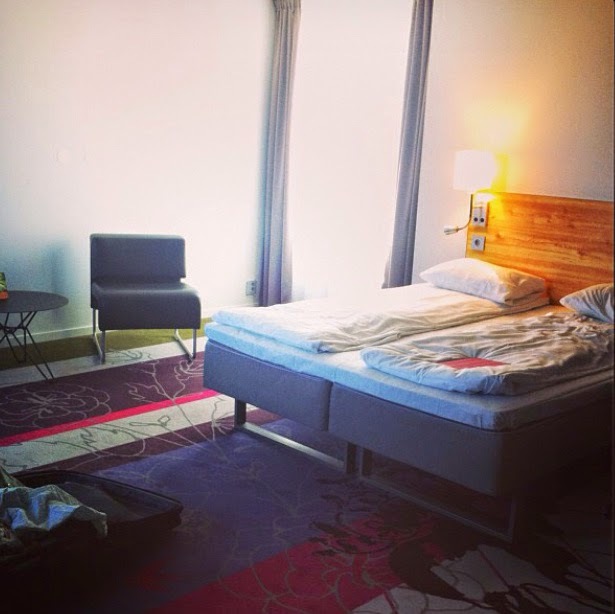 This post is an assortment of crappy photos but I wanted to share some of my favourite hotels in Europe. I've said before that I have a particular type of hotel style when it comes to choosing accommodation, I hate generic chains and would much rather staying in a unique, boutique hotel. You may think that boutique hotels are really expensive but if you have a look around you can find some that are very reasonably priced. A lot of the places I've stayed are cheaper than those big soul sapping chains so it's 100% possible to travel in style whilst remaining on a budget. I imagine this post will develop over time as I add new places to the list but for now let's start with my favourite five hotel finds of recent years. First up is the Michelberger Hotel in Berlin but I won't dwell on this too much as I wrote a post about it the other day, here. I love the inventive rooms and it's location in the city is unrivalled if you enjoy the delights of East Berlin. Rooms start at €80 which is super reasonable for such an awesome, fun place plus Burgermesiter is only a 5 minute walk away. Last year I spent a long weekend in Istanbul with my friend Katie. Istanbul alone is a wonderful city with lots of culture and amazing food, plus it's cheap. We stayed at Mama Shelter which is a small chain of French hotels specialising in stylish and chic interior. I stayed in the Paris branch a few years ago which is very cool and my friend Yishyene wrote a review about it the other day which is worth reading. The Istanbul hotel is much of a muchness, however I found the rooms a lot more spacious and airy, we even had a balcony overlooking a private courtyard. I love that all the Mama Shelter rooms come with fun accessories like superhero masks and impressive movie selections, it's make your stay more memorable. The hotel has a lovely bar and rooftop terrace plus it has the perfect location of being situated on the main road, İstiklal Caddesi, so you can get about the city easily. Our room was really big with an excellent shower and our stay couldn't have been more comfortable. I'm keen to stay in the Lyon branch when Steve and I eventually visit, plus they're in the process of opening a new branch in LA which is very exciting. Prices vary depending what city you're in but in Istanbul the cheapest room is €79 a night which is extremely reasonable for the generous space, excellent service, and the unique experience you receive. Last year Lily and myself attended Primavera in Barcelona so we wanted to stay in a fun hotel whilst revelling at the festival. Chic and Basic is a small chain of boutique hotels in Barcelona (and one in Amsterdam), we chose to stay at Chic and Basic Born as it was slightly closer to the festival site. As the name suggests, the hotel was pretty chic in a minimalist sort of way, the room was very reasonably sized and we even had a little balcony overlooking the street. We were given a Welcome Pack that contained sweets and all sorts of fun things to make our stay more enjoyable. My only issue with this room was the bathroom situation. Can you see the beading on the left hand side? Well the shower is behind that so there's not a lot of privacy. This wouldn't be a big deal for a couple, but for friends it was lacking in privacy some what, but I suppose that depends how close you are. See through bathroom aside the hotel was lovely, there was a common room area with free tea, coffee, water bottles and biscuits. We were coming back very late due to the festival but the hotel was quite and tranquil, a nice place to relax. Next time I'm in Barcelona I'd like to stay in Chic and Basic Ramblas as it looks really fun and colourful. There's also a choice of Chic and Basic apartments and hostels as well which means there's something cool to meet everyone's budget. Chic and Basic, does exactly what it says on the tin. Last year Steve and I spent nearly 2 weeks travelling around the Baltics, with Helsinki as our final stop. Being a lover of all things Scandinavian and Nordic I wanted to stay somewhere that fitted this style without the harsh price tag and Hotel Scandic Passi fitted this description perfectly. The Scandic hotel chain is actually pretty big, with hotels all over Europe, but the Helsinki branch lacked any sort of generic vibe and felt really unique and independent. Our room was absolutely lovely, with a warm and laid back vibe. The general colour scheme was traditionally Nordic with lots of unfussy wooden furniture but with a few pops of colour from the cushions to stripy wallpaper. One of the best features of this hotel was the included breakfast; a enormous buffet of hot and cold food. We feasted on eggs, fish, pastries and much more every morning. Followed by a short metro journey into the centre of town we couldn't get the day off to a better start. With rooms starting at €85 a night you'd be hard pressed to find such a fantastic hotel for the same price in a Nordic capital. 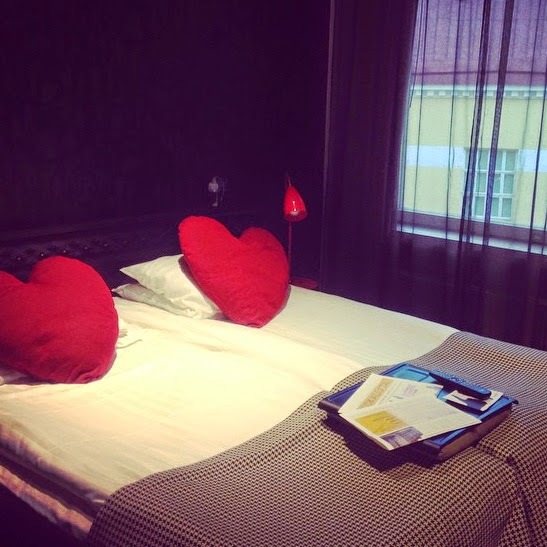 It's been a few years since I visited the wonderful Norway but I have such fond memories of my time in Oslo and much of it is due to my stay at Comfort Xpress Hotel. This hotel is really quirky and the lobby feels more like a trendy hostel than a hotel, it's really colourful and comes complete with a football table and pinball machine. There's a lot of musical influences here and whilst it's design is very contemporary it still captures that unmistakable Scandinavian vibe. The cool thing about this hotel is that all the rooms are the same price regardless of size. Depending on the exchange rate prices start around £55-60 a night which for a country as expensive at Norway is really cheap. Here's a little secret, ask for room 1013 when you book as it's double the size of everywhere else and has incredible panoramic views across the city. I was lucky enough to stay in this special room and it really made my stay a special one. The hotel is really central plus it's a stone throw away from Illegal Burger which is another great reason to stay here. Even though I don't spend a lot of time in my hotel room when I'm on holiday I still think it's important to stay somewhere interesting that matches the vibe of the city you're in. A charming and fun space can make your holiday all the more memorable and it doesn't have to come at a ridiculous cost. I'm really looking forward to staying at KEX Hostel when I visit Reykjavik in July plus there's sill lots of researching to do for my holidays later in the year, I can't wait! Ah I'll be keeping Mama Shelter in mind as Istanbul is on my list soon! Love these, adding them to my list of places to try when I finally visit Europe properly! I'm popping all these to my list of "places to go." Thanks, travel queen!